Real college football players' names are not supposed to appear in video games if they're still in school at the time they are published. 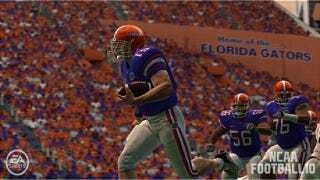 But Tim Tebow's name slipped into NCAA Football 10, which came out during the Heisman Trophy winner's senior year at Florida. Tebow still was called "QB#15" in the game itself, unless you edited the roster or downloaded one from someone else. This usage concerns a play available in the Florida playbook—"Shotgun Twin QB Tebow"—whose full name was visible only in a dynasty-mode feature that hasn't been in the game since. An SB Nation reader spotted it last week. This is interesting because, as you may know, former college players are suing the NCAA and EA Sports over the unauthorized use of their likenesses in college football and basketball video games. Currently, NCAA Football's roster features performers whose heights, weights, ethnicities, uniform numerals and talent level generally conforms to the real world (especially for star performers) but does not use their names. The plaintiffs say they still are meaningfully recognizable in these games. Tebow's name in a football play doesn't sound to me like a use of likeness though. As the playbook may be used for any team, the name plainly identifies a formation the movements of 11 players after the snap, not a specific performer on the field. As a frame of reference, the Tiger Woods PGA Tour series populates the leaderboard of its career events with all the real names of those currently on tour. Only two dozen tour pros are licensed to appear in that game this year. But the name-only references are fair enough, provided that's the extent of the representation. Even applying that name to a computer-drawn shot arc in a playoff scenario would be over the line. What this does show is another example of those making NCAA Football 09 basing the game on real and current college performers. But we already knew that. Any thinking person, as I have said, knows Tim Tebow was "in" this game in 2009, and 2008, 2007 and 2006, along with his teammates and everyone else playing college ball at the time. But it's up to a court to make that into a finding of fact.